Ellison "Gil" G. Gilbert, Jr.
Black Creek- Ellison Griffin “Gil” Gilbert, Jr., age 69, passed away Saturday, November 17, 2018 at his home. Mr. Gilbert was born September 23, 1949 in Savannah to the late Betty Paige Gilbert and Ellison Griffin Gilbert, Sr. Mr. Gilbert was a graduate of Statesboro High School Class of 1969 and was a Vietnam veteran, having served in the United States Air Force. 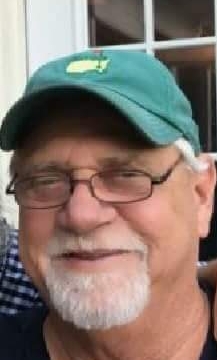 He retired as a truck driver with Silver Eagle Transport, was an avid golfer, loved the Georgia Bulldogs and especially loved his time with his grandbabies. In addition to his parents, Mr. Gilbert was preceded in death by his sister, Betty Lynn Baxter. Survivors include his wife, Patricia “Pat” G. Gilbert of Black Creek; son, Wesley Gilbert and Grant Gilbert, both of Statesboro; daughters, Nicki Miles and her companion, Kevin Coursey of Black Creek, Jessica Miles of Pembroke and Billi Stewart and her husband, William of Black Creek; sisters, Nancy Yarbrough of Bloomingdale and Debra Paige Gilbert of Arizona; grandchildren, Cecil Dewitt Miles, Heaven Leigh Terrell, Russell Banks White, Zoe Marion Coursey, Liv Marie Coursey, Griffin Wade Guy and Windsor Marie Gilbert; and his dog, Jezebel. The family will receive friends, 11 a.m. – 1 p.m. Tuesday, November 20, 2018 at the funeral home. A memorial service will follow at 1 p.m. in the chapel of Flanders Morrison Funeral Home with Rev. Russell Rogers officiating. Flanders Morrison Funeral Home and Crematory is in charge of the arrangements for Mr. Ellison Griffin “Gil” Gilbert, Jr.